Siquijor is one of the go-to-places that I would love to visit for a quick getaway. Not only expenses are cheap but the peace and beauty in the island makes your stay very worthwhile. Siquijor is said to be the third smallest province in the Philippines next to Camiguin and Batanes. In Spanish era, it was called as “Isla del Fuego” or Island of Fire because of the abundance of fireflies that swarm around the molave trees. And I believe that the larvae of the fireflies live only in clean flowing water and they love to enjoy the cool evening air. This means that Siquijor is one of the most preserve and cleanest province in the Philippines. Siquijor has a land area of 327 square kilometres (126 sq mi) and a coastline 102 kilometres (63 mi) long and being the thrid smallest province in the Philippines, you can tour the whole island with only half day. In our case, we rented a tricycle which accommodates for persons for only 1,200 pesos. Actually, you can lower the price down to 800-1000 pesos if you know how to haggle. Since we asked the driver to fetch us from where we stayed and send us to the port the following, we paid the price that he told us. This is located in the town of San Juan and it is usually the first stop of your day tour in Siquijor. 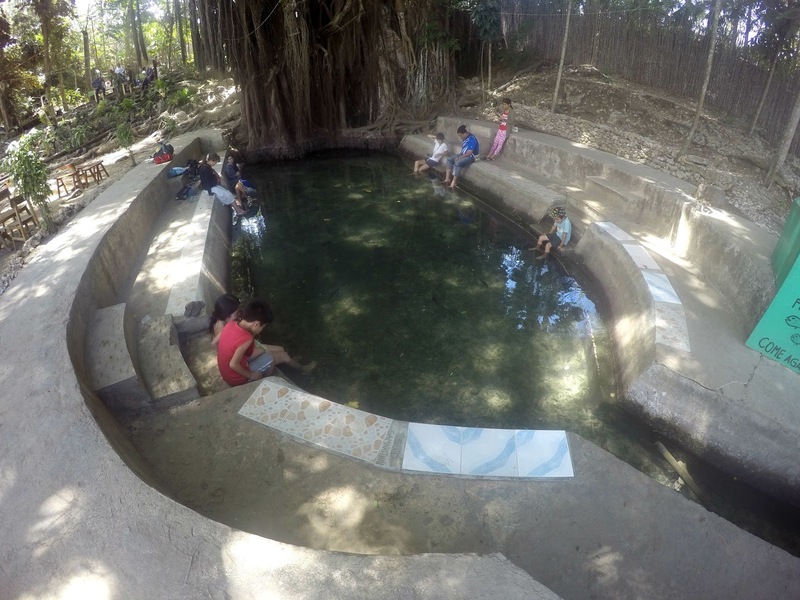 This is natural spring pool is situated at the heart of the town park which is in the southwestern portion of the Siquijor province. This has a pool with three chambers with colorful floaties to choose from. The upper pool is where the springs located, the second is where the swimming pool is then the third one is the laundry pool or also known as thte “river”. You can have your snacks or lunch by the pool sides for there are kiosks if you want to spend the whole day in there. In old folklore, people believe that balete trees are dwelling places for supernatural beings like kapre, tikbalang or white ladies. The old enchanted balete tree in the town of Lazi, Siquijoe is known to be the second oldest and largest balete tree in the Philippines. The first one can be found in Aurara province which is called as “Millenium Tree”. The special thing about this balete tree is that on its base is a cold spring that streams out into a pond which explains the tree’s longetivity and size. You can sit on the edge and dip your feet on it while curious fishes nibble on your feet. Well, that’s a free foot spa! Cambugahay Falls is located 2km north of town of Lazi and this is one of the favorite attractions in Siqiuijor. It gives you an astonishing view of cascading multi-tiered waters flowing once you walk down the 135 steps from the highway. These waters are 3 kilometers downstream forming a majestic swimming lagoons and rapids along the way before it ends into Lazi Bay. This 160 years old Lazi Church is also known as Iglesia Parroquial de San Isidro Labrado which means San Isidro Labrador Parish Church. It was established by Augustinians Priests under Patron San Isidro Labrador in 1857. The church was built with sea stones and hardwood by Filipino artisans and it was finished in 1884. The church bell was finished a year after. 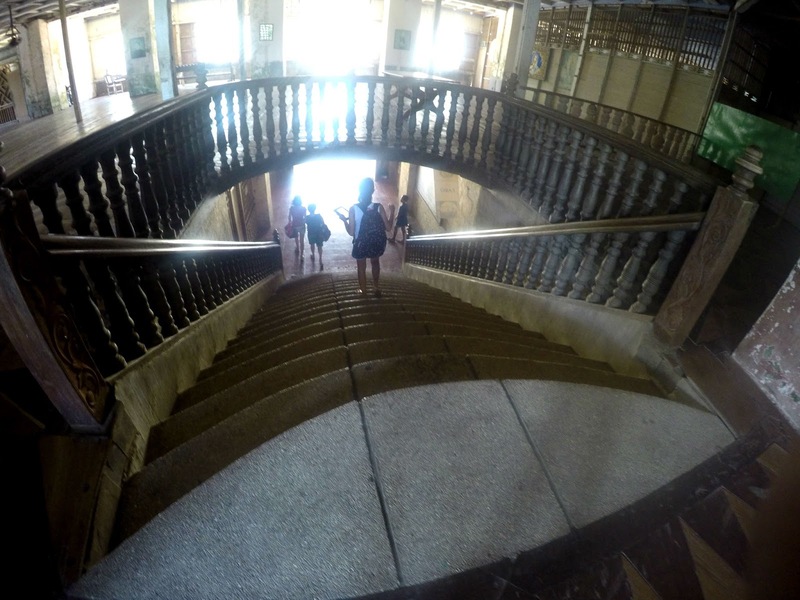 The church was also known for its huge U-shaped convent was the largest convent built in the Spanish colonial era. The convent was declared a National Cultural Treasure by the National Museum of the Philippines and was listed under the Baroque Churches of the Philippines. Baha Ba’r is situated in the heart of Maite Village which is 1km south of San Juan town and 8km from Siquijor port. This is one of the newest discoveries I had when I went back last 2016.The restaurant is designed and built to reflect the traditional island wood designs which is great for relaxation for the tourists. One of their best sellers in their menu is their home made ice cream which became my favorite. Siquijor is also known for it’s pristine crystal clear waters and white sand beaches. One of their famous beaches is the Salogdoong Beach which appears in different shades of blue as you go deeper. It is situated in Olang, Maria, Siqiuijor which is approximately 30 kilometers away from Siquijor Port. The last time when we had an overnight stay in Siquijor, our last destination was Salagdoong beach it was scheduled few hours before our departure. So we had to wake up at 7 am and spent the whole morning by the shore. And of course, the cliff diving. They said your Siquijor Adventure won’t be complete if you don’t go cliff diving in Salagdoong. Unfortunately, I wasn’t gifted for that skill and I guess I am the only beach lover who doesn’t know how to swim in deep waters.